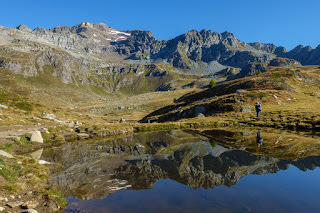 After a surprisingly minimal breakfast we leave the hut and head up the couple hundred meters to the Albrunpass. The morning is clear and the views down into Wallis are quite nice (the hut has a great view of the Bietschhorn and the Nesthorn). In the pass we hit the sun and pick up nice views down into Italy. We play around a bit in the pass, taking pictures and doing some scrambling on the big boulders that are there before continuing on our way down, down into Italy. 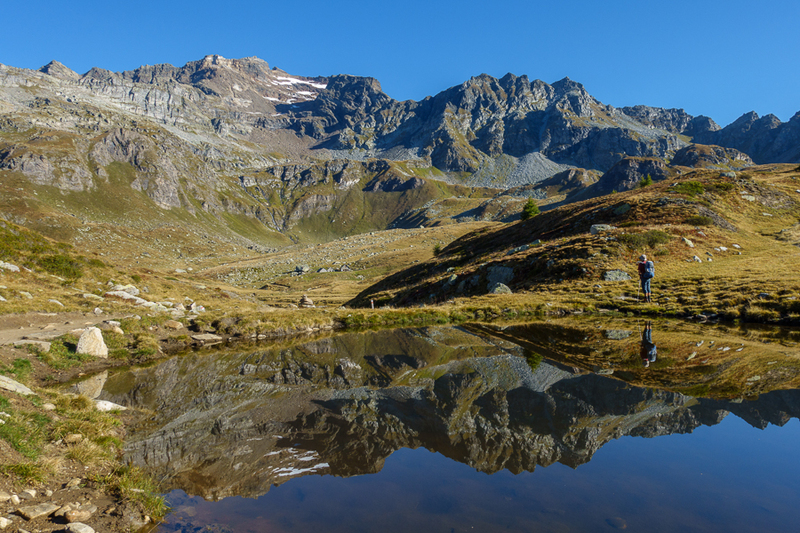 The trail leads us curving down onto a high plain and then by a largish alp (Alp Forno) and then along a stream across the high plain. We do an energy bar break (the new batch is quite good) in the sun before we turn off at the Alpe la Satta and contour around and down (in the shade, brrrr!) to the Alpe della Valle. 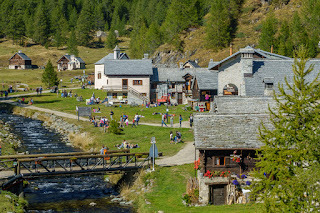 Around the corner, and back in the sun, we meet the trail coming up from Alpe Devero, now there are more people around, and we turn off to the left and start to climb through another small valley up towards Alpe Naga and the Passo Pojala. Up up we climb while the views open up around us. When we find a good spot we stop for lunch with nice views back across the valley towards the Albrunhorn, Ofenhorn, and the rest of that chain. A couple of groups pass us in each direction while we are eating (this is not a lonely path after all!). We check the map and find an alternate route around the other side of the ridge and past a couple of lakes. So up up we go onto another high plain, past a big patch of wool grass and then through the broad Passo Pojala over the Lago di Pojala. 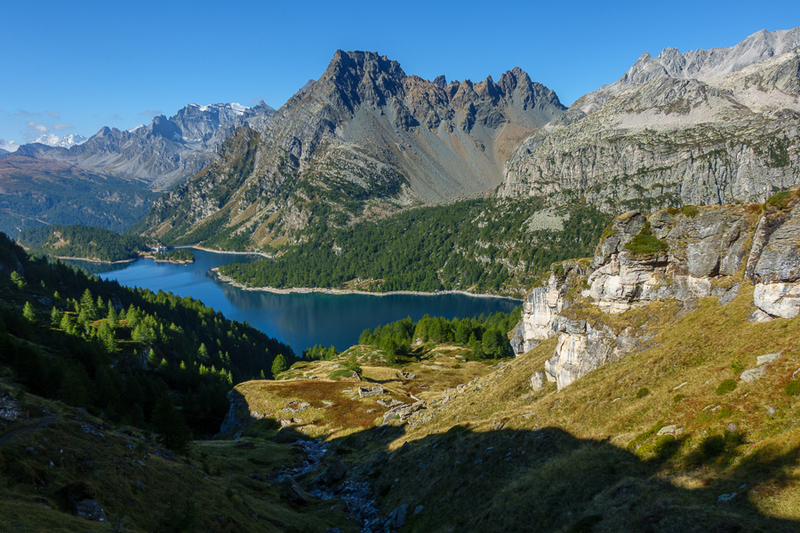 This is a really, really pretty alpine lake nicely situated in its valley and surrounded by likely camping spots (next time). Around the lake we go and then down to the next long plain with a few buildings placed picturesquely at the end (Alpe Pojala). An aside at this point: this day had so many absolutely fantastic views that it's really impossible to describe, so I haven't tried. We spent a lot of time saying "wow" and giggling to ourselves as we hiked. Across that valley and to the houses (mostly abandoned with a couple of modern container like structures that are now lived in), where we have a break and a snack, and then we turn off to the right and climb gently along the slope, with a view down to the artificial lake (Lago di Agaro) below opening up, until we reach another pass (Botta di Scarpia). We bid the views to that side goodbye, greet the views of the Albrunhorn et al. again and head down the other side, through the woods, down down down, until we hit the bottom of the valley at Crampiolo. Here it's madness! 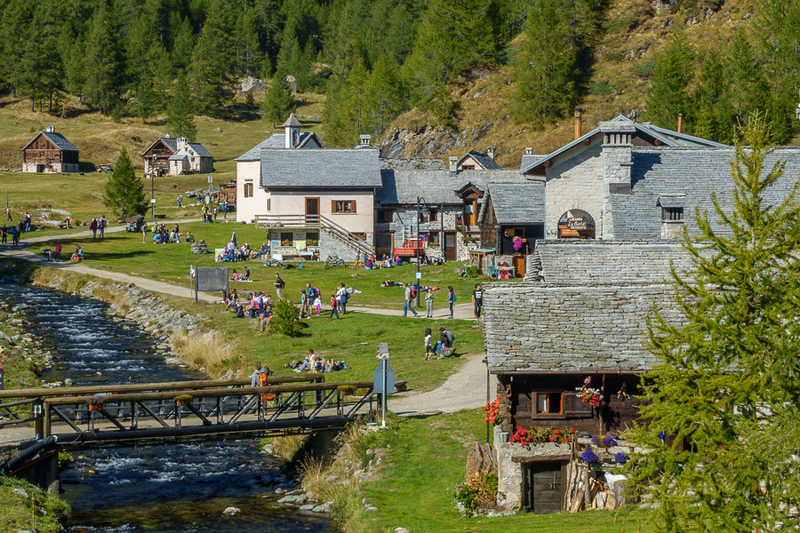 It's a sunny Sunday afternoon and a short walk from the parking at Alpe Devero and the Italians are out in force. We manage to check into our hotel (greeting the two Swiss we had eaten with the previous night), have a rest in the sun and a cool beverage, do a short stroll around town to buy some cheese (and eat a bit of yogurt), take a nap, and then have a nice meal before heading off to bed. What a day!